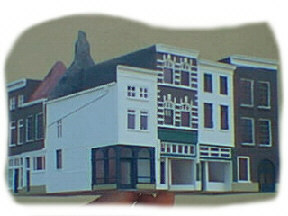 This is a project from a block of houses with stores. 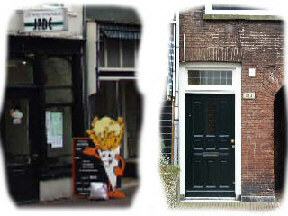 The original is located at a shopping area in the city of Dordrecht, "Voorstraat", the Netherlands, which by the way is the oldest city of the Netherlands. 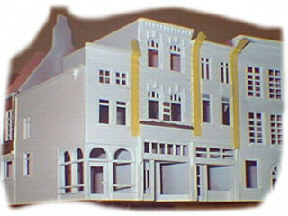 It is not hard to build structures out of plastic card, if you can build kits like DPM and Walthers, then this will be no problem. The materials needed are plastic card, strip styrene, brick and roof detail sheets, and what ever else you may find in the shoebox. 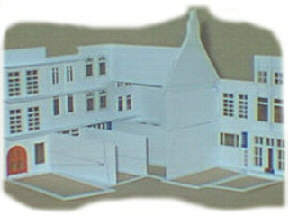 (Many modelers have leftover parts like windows and doors, from kits they build, if not these items are easy made with strip styrene). The tools I use are the ones the average modeler use, a X-acto knife, pocket knife (much less sharp), a set of miniature files, 45 and 60 degree angles, plastic and super glue. 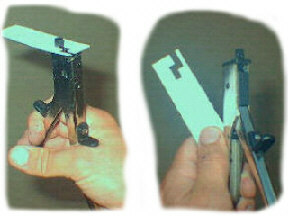 I also have a special tool, which cut square holes in plastic, which I found at Radio Shack. I start with making the walls, which are visual on the original photo, and later the backside of the structure. Incase you make a background structure, you don't need a nice detailed back, just a plastic sheet for strength. For this project, my fantasy created the back site, since I don't have a photo of it. First I study the windows and doors from the original photo. In the shoebox I try to find the best matching one's. Next I look for a reference to calculate a value needed to obtain a proper scale. 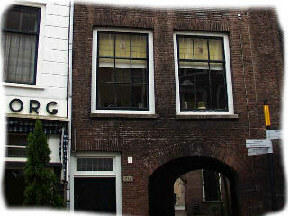 I like to match my structures with the one's I have from Volmer and Artitec, which are German and Dutch manufactures. I am not to precisely when it comes to the measurements, how ever, as long as the outcome matches the photo. I don't make a plan on paper, I draw directly onto the plastic card. When I am satisfied with it, I cut it with the x-acto knife. With the special tool I cut the openings for windows and doors, and with the small files I make the openings fit perfectly with the windows, that will be glued from the inside, how ever, not yet. 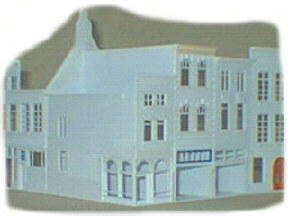 The front will now be "decorated" with brick, where needed, and smooth plastic card if no brick is needed. This will coffer the openings. If a wall stands out from the others, I fill it with some plastic card. The plastic it self glue easy onto each other, but I use superglue for the brick card. Now it's time to paint the structure. 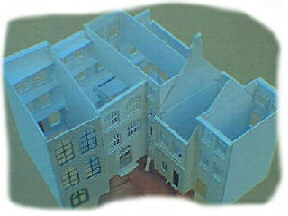 I wait with building the roofs until I have finished painting, and installed window "glass". One more look to check if nothing has broken or forgotten. First I wash the structure with water mixed with a bit of dish liquid, and after it dried I then spray-paint the primer on it. Without the primer the paint won't stick. I use a can of regular primer, from Wal-Mart or K-mart, usually about 1 dollar a can. This works just as good as a can of 4 dollar at the local hobby shop. After the primer dried, I check the structure one more time, because small details are much clearer to see, which now can be corrected, if needed. Since this structure has white walls, I paint these with a can of flat white spray paint, again the cheap one from the local Wal-Mart or K-mart. After comparison and some experience I like to use Tamiya paint. This paint works great, and is water based. I always put all the bottles on the table and make a selection according to what matches the original, as I am painting. I used red brown and flat brown for the brick walls. I use 2 or 3 coatings, depending on the outcome. The mixing ratio with water creates some color differences. After the walls I paint the windows, which almost all of them become dark green. 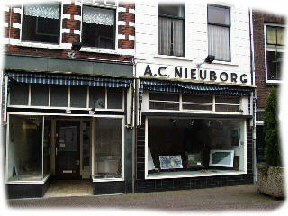 I used NATO black for the windows in the front corner, see photo, and some doors. After all this dried, I touch up the windows and other painted items, that required some better detail, since I don't have a steady hand, for fine work. 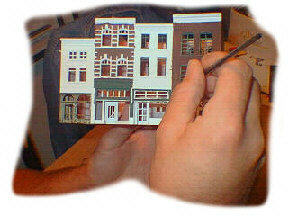 Last thing to do is to give the structure some more detail by painting doorknobs, downspouts and other small details. 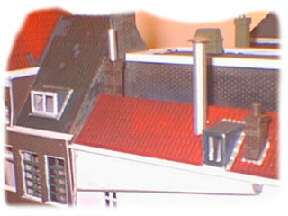 To make the roofs I used a sheet of plastic tile, from Volmer. Since they are not cheap, and easy to come by, I made a latex mold so I can cast my own roof tile sheets. This will also safe me some money, which can be used to purchase other hobby supplies. Before I knew I used 3 sheets. The way to make the roofs goes the same way as the walls of the structure, as mentioned earlier. However watch the tile's direction so they are not upside down. The corners have to fit perfect and have to be cut under an angle. This angle has to be exactly right, otherwise you will notice it soon. The easiest way is to draw this on a piece of paper first. 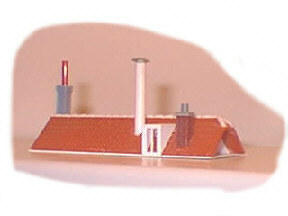 Auhagen makes a set of roof end tile's, the ones on top of the roof. 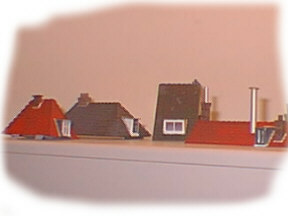 In the Netherlands, and most other parts of Europe, most roofs are made of clay tiles and at the top they use different tiles, the ones I am referring to. Unfortunately this is not for sale in the USA, not even from other manufactures, so I had to come up with an other idea. To my knowledge, American houses don't have roofs like the ones in Europe, so that's the reason, I guess, the hobby shops don't sell it either. I used a halve round strip styrene from Evergreen. This I filed in the shape of the roof tile ends, actually I don't know the right English word, so I use this to give it a name. It is better to give the roof this tile end, then not at all. If I do get the real tile end later, I can easily replace it. I made the roofs as separate individual units. This way I can get inside the structure easily to replace light bulbs, when needed, and to install window "glass" and curtains, since the structure is still accessible trough the top and bottom. I painted the entire building and roof units separately and sprayed a dull clear coat over it. The "glass' from the windows on the roofs are made with "testors window maker", which is almost the same as crystal clear. The windows of the building it self I make from small clear plastic sheets, ones that my father used for his postage stamp collection. This is just like Pola does with its structures. The computer will be used for printing curtains to place behind the windows, and that finish this project for the time being. I like to install house numbers and an interior for the corner snack bar, but that comes later. 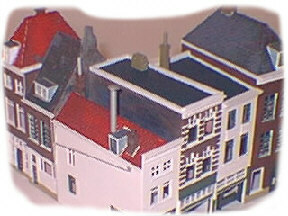 As I am working on the roofs and detailing this structure, I miss being able to walk by the real thing, in Holland, to look for details and things that are not visible on my picture. For instance I don't know if two of the roofs are flat or not. 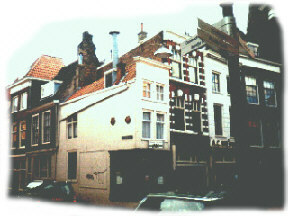 In the city of Dordrecht, as far as I remember and by viewing other pictures, there are hardly any flat roofs. On my original picture, two store fronts are blocked by a car, so I've let my fantasy do the work, since I can't tell how it relay looks. 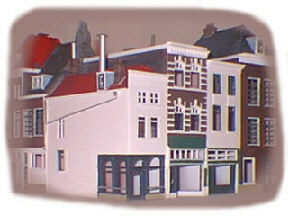 From W. de Goede, who lives in Dordrecht, I received information and detailed pictures to help me finish this project. The corner house, snack bar, is a Chinese carryout center. 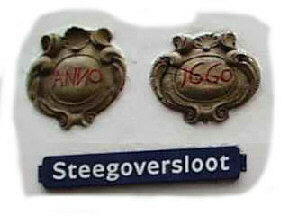 Thanks to Mr.. W. van Schaardenburg I new know that the house number is 206. The house numbers from the other units are 208, 210 and 214. 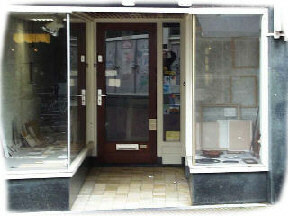 Number 212 might have been removed from the building, since it doesn't have a door anymore. 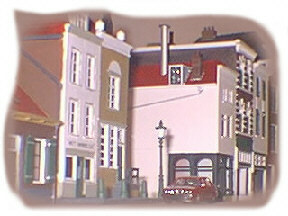 The tall exhaust stack on top of the corner house, is a requirement from the local government. Near this building was a bad odor problem. 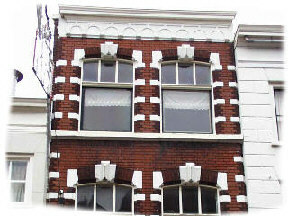 Thanks to these detail pictures from W. de Goede, I know that this building goes back to the 1600's, as is visible by the two ornaments, attached to the side wall.